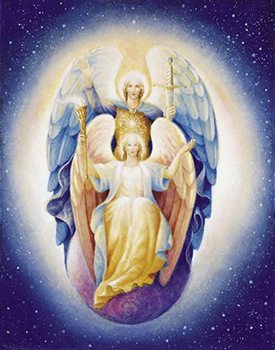 I am Archangel Michael and together with my twin flame, Archeia Faith, we bring you a lesson of love. Love for yourselves and for the whole planet, for the cosmos, for the light. We say about the path of light that flow from the love that anchor in their hearts. How many times in their lives they reached out, opened a door, pulled out a chair, gave a smile, said good morning, and in those small acts began to open a road of light to those around them and in their hearts. This road shines and illuminates the hearts that needed a simple cherish to remind them that there is much peace and love in the midst of chaos. The tone of the voice, the brightness of the look, is something they do not conceive when their hearts shine to operate with bridges of light bathing many around them. It is these acts that open them to enlighten human life and, treading this path, discover the purpose of light that anchor in the planet. The greatest purpose, my sweet masters, is to serve, not to give oneself and never to be magnified by your actions. But in giving yourself, in serving, you naturally magnify yourself in light, and the doors of those roads shine out your own walk, radiating your greater purpose to all the afflicted hearts. They are drops of light that gradually become joy, peace, light, love that add to your soul that is already made of light and allows it to shine in the greater purpose of the fellowship of all, without discrimination, without judgment, No choice, just accepting the choice of each brother. And in these acts that promote together with their brothers, although inserted in the matter, they walk towards the learning of soul. This learning is nothing more than the shining of his love, his peace and his faith for all humanity, recognizing the brotherhood in each heart. And this becomes the greatest soul-learning they can receive. This learning can often be confused as a mission. That mission to which we have been assigned in this life to fulfill and assist humanity and ourselves. But sometimes we just forget about ourselves. And we just remember that we came here to bring something for humanity to benefit. In this way, we go through much of our life repeating experiences where we put others first before ourselves. And so we are repeating this action that we do following the heart. In this action of giving, giving way to the next, we are the beneficiaries ourselves. For we realize, after a long journey where we repeat this experience even when we realize that we are being left to help the other, we see that there is no point in thinking differently. To think differently would be to follow in the opposite direction to that which commands our own heart. To the detriment of the happiness of the other, we let our flow, without investing any effort for it to appear. But we forget that there is someone always working for our happiness. This one is often distant from our physical eyes, but we perceive it all the time when we put the other in the first place, for we are hearing that voice that comes from our heart. The love given to the neighbor, placing it first, is the same as that we receive from those who came to help us, and who live in dimensions different from ours. These are those who have pledged to help us during our journey of light and inner growth. And as we work for the growth of the other, we are allowing the free flow of the light within ourselves, for we begin to place ourselves in the role of a small road, which in this life is what causes the energies to be carried away One place to another. So many think that on this road there is no way out, or that it does not even exist, but, through those who put the other first before themselves, little by little the truth opens. Which shows that the true road is eternal, and that, as it is built, by giving itself to others, it will add more streets, connected to that road, and which will also carry the light received from the road to other places. The radiate of light from this road, which is formed from the work done with love and bestowal, is something that can not be measured. From the moment it is started, there is no longer how to measure where the roads will reach, and where those small streets will lead. And where the small streets will become great roads, radiating more love and light to other small alleys that are forming. The work of light and love, which starts from the moment you accept to give without expecting a return, simply because you let yourself be touched by the suffering of the other, because you do not see the sense in being happy or having what you want, if the other Also can not receive and enjoy, this yes is the feeling and the attitude that awakens the inner light. From the birth of being, he is present on the planet to bestow his love. To donate your light. To manifest the divine in itself. But so many of you, children, delude themselves into thinking that the road is built only for their own walks. So many of you consider unjust some relationships where there is only giving in love, without expecting return. Where the simple act of giving oneself makes the person who is giving himself fully happy. This happiness, children, is something immeasurable, because it makes love in the heart. And this love can not be measured, for it will eventually become a long road of light, where it will illuminate so many others, who, mirroring themselves in example and love, will begin their own walks of light to build a future of love. The act of giving oneself, the act of manifesting love without expecting a return to oneself. It is the opening to receive the divine light within themselves. Therefore, children, those of you who have lived so many years of their lives placing in second place before your brother, giving in love to the problems of others, were working to open this channel of light with the divine. And a small street began to materialize. At first, this street was stone, earthy, rustic, bringing you pain, sorrows, learning, and even dissatisfaction with those for whom you have always bestowed all your love. You have been misunderstood, tried, accused, to take your lives in the wrong way. But they simply did not know how to be different from this, for you were listening to your true essence. This little street led you to suffering paths, to build a beautiful road, robust and illuminated. And those who passed through your lives bringing suffering, sadness and pain, were incorporated into your light, were agents who contributed to build your roads and transform them by adding in you the light of forgiveness. This was a lesson that needed to be learned, so that the work of loving giving would be complete. Forgiveness for those who caused them evil were preparing them to love unconditionally all their brothers and sisters, and they were helping you to begin to create gigantic wings of light and love. As angels to manifest this love to the whole planet. These wings, this being that has just been born, will illuminate not only its own road, which now reaches multiple existential dimensions, but also the road of so many others, who observe its work and its light, its love, not May fail to feel all the love radiated from this new being, even in the simplest words. It shines love and light. So are you in this New Age, children. So are you, returning the essence from which you came. Re-meeting with yourself. For we have said here so many times that you are light and love and are children of God. And you are the transformers of the lives of all and of the lives of yourselves through love that channel directly from the divine, manifesting in beautiful angels of golden light that become to illuminate all life on this planet of pure love. Be involved in the light, dear children, certain that you are the angels who have come to manifest love, the liberation of all planetary density and to be examples of overcoming and forgiving. Messengers: Thiago Strapasson and Michele Martini - March 03, 2017.